Friday May 1st 1891 It was a pleasant day. I done some baking in the forenoon and done some mending and practiced a little. Will went to town in the evening. Agnes was home in the afternoon. I wrote to Lizzie Duncan in the afternoon. Will finished plowing here and at home. Saturday May 2nd 1891 It was a drizzling day. I got the cellar cleaned out and some work done about the place. I was busy all day it seemed without doing much. Will went to town in the evening. Sunday Mar 3rd 1891 I was busy with the work the whole forenoon and after the dinner was over Will and I drove to Wood Lawn. Fanny was suffering with [neuralgia?] and Will went to get the Dr but did not find him. She was better before we came away. We went out to Woolfs and found them better. Agnes did not come back and Will helped me through with the work. Monday May 4th 1891 We done the washing in the forenoon. I started to go down as far as Robinsons with Will in the waggon as he was going to Daltons for oats he had been to the valley for seed corn in the morning. It looked so much like rain I gave it up and went to Mrs [Niphens?] a few moments. It looked brighter after a little and I walked alone to R --- s We were late getting the evening work done up. 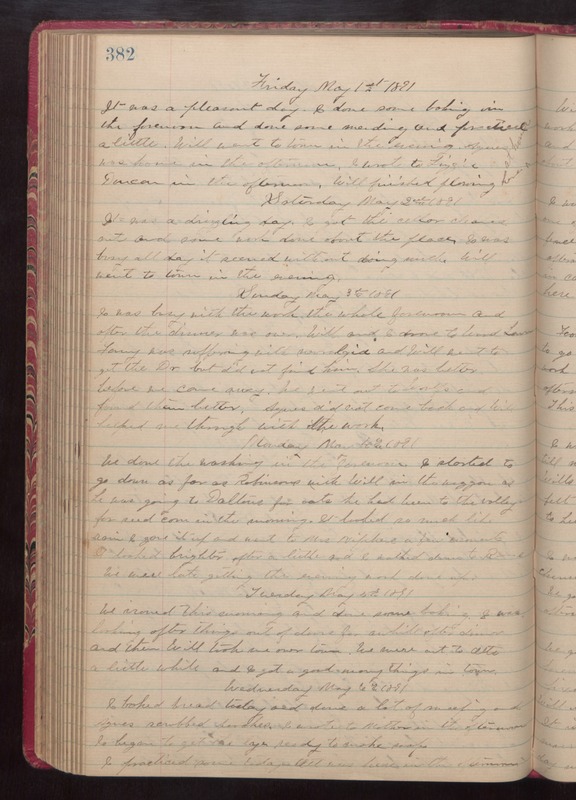 Tuesday May 5th 1891 We ironed this morning and done sone baking. I was looking after things out of doors awhile after dinner and then Will took me over town. We were out to Otts a little while and I got a good many things in town. Wednesday May 6th 1891 I baked bread today and done a lot of sweeping and Agnes scrubbed porches. I wrote to Mother in the afternoon. I began to get the lye ready of make soap. I practiced some today. Ott was here in the afternoon.